WASHINGTON (May 16, 2012) -- More than 42 years after performing selfless, heroic actions in Cambodia, which resulted in his death, Spc. 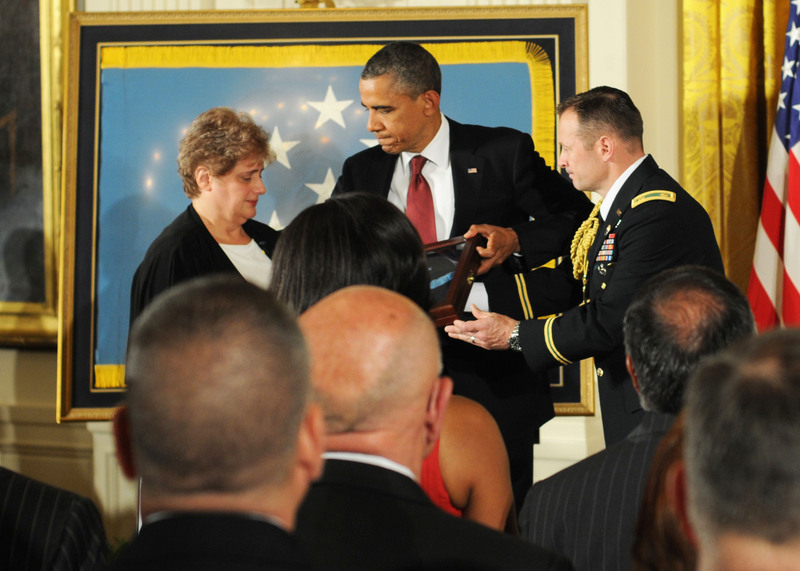 4 Leslie H. Sabo Jr. was recognized at a White House ceremony when his widow accepted the Medal of Honor on his behalf. Among those attending the May 16 ceremony in the White House's East Room were Sabo's widow Rose Mary and members his unit: Company B, 3rd Battalion, 506th Infantry, 101st Airborne Division. During a ceremony at the White House, May 16, 2012, Spc. 4 Leslie H. Sabo Jr. Sabo was posthumously awarded the Medal of Honor. The award was presented by President Barack Obama. Sabo's widow, Rose Mary Sabo-Brown, received the medal on Sabo's behalf. Sabo was killed in Cambodia in May 1970. President Barack Obama presided over the ceremony, addressing Sabo's widow, his brother George, his fellow comrades in arms, and more than 100 other military personnel and government officials in attendance at the event, including Secretary of Defense Leon Panetta, Vice Chairman of the Joint Chiefs Sandy Winnefeld, Secretary of the Army John McHugh, Chief of Staff of the Army Gen. Ray Odierno, and Sgt. Maj. of the Army Raymond F. Chandler III. "Today is also a solemn reminder that when an American does not come home from war, it is our military families and veterans who bear that sacrifice for a lifetime," the president said. "They are spouses, like Rose Mary, who all these years since Vietnam still displays in her home her husband's medals and decorations. They are siblings, like Leslie's big brother George, who carries the childhood memories of his little brother tagging along at his side. And they are our veterans, like the members of Bravo Company, who still speak of their brother Les with reverence and with love." It was 42 years ago this month, May 10, 1970, that Sabo was killed in action in Cambodia. Sabo and his platoon had been conducting a reconnaissance patrol in Se San, Cambodia, when they were ambushed from all sides by a large enemy force. Sabo charged an enemy position there and killed several of the enemy soldiers. Afterward, he assaulted an enemy flanking force, drawing their fire away from friendly Soldiers and forcing the enemy to retreat. In order to re-supply ammunition, Sabo sprinted across an open field to a wounded comrade. As he began to reload, an enemy grenade landed nearby. Sabo picked up the grenade, threw it, and shielded his fellow Soldier with his own body, absorbing the brunt of the blast and saving his comrade's life. Wounded by the blast, Sabo charged an enemy bunker that had inflicted damage on the platoon, and received several serious wounds from automatic weapons fire in the process. Mortally injured, he crawled toward the enemy emplacement and, when in position, threw a grenade into the bunker. The resulting explosion silenced the enemy fire, but also ended Sabo's life. "Leslie Sabo left behind a wife who adored him, a brother who loved him, parents who cherished him, and family and friends who admired him," the president said. "But they never knew. For decades, they never knew their Les had died a hero. The fog of war, and paperwork that seemed to get lost in the shuffle, meant this story was almost lost to history." 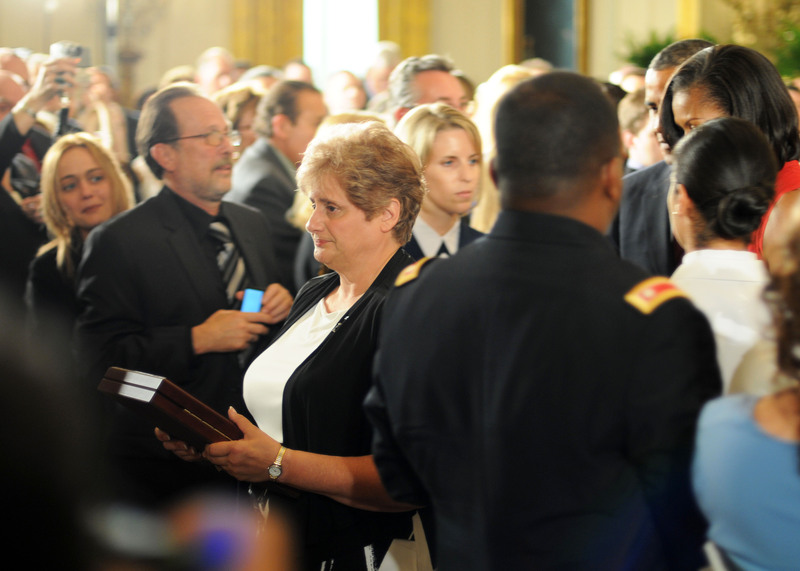 Rose Mary Sabo-Brown leaves the East Room of the White House following a May 16, 2012, Medal of Honor ceremony there. Sabo's husband, Spc. 4 Leslie H. Sabo Jr., was posthumously awarded the Medal of Honor for his actions, May 10, 1970. Sabo was killed in action that day. The president explained that it was a Vietnam veteran from the 101st Airborne Division that had found a proposed Medal of Honor citation for Sabo amongst archival material in the National Archives. That veteran asked the questions necessary and put in the effort required to turn that proposed citation into recognition for Sabo. The president thanked the veteran for making it know to everybody that Sabo was a war hero -- deserving of the nation's highest military honor. But Sabo wasn't the only Soldier who died that day, the president said. Seven others died alongside him. "Those who came home took on one last mission -- and that was to make sure America would honor their fallen brothers," Obama said. "They had no idea how hard it would be, or how long it would take." Following his remarks, the citation for Sabo's Medal of Honor was read, and the president passed the framed medal to Sabo's widow, Rose Mary. Rose Mary and Leslie had been married after Leslie returned from basic training, and before he shipped off to Vietnam. Following the ceremony, Rose Mary Sabo-Brown said it is not just her husband she keeps in her heart. "My heart beams with pride for Leslie because he is finally receiving tribute for his sacrifices and bravery," she said. "Along with Leslie, please don't forget the seven other men who lost their lives that fateful day in 1970. They are all heroes to me too." More than 58,000 American service members were killed during the Vietnam War. America first sent troops to the country in 1962, 50 years ago. "This month, we'll begin to mark the 50th anniversary of the Vietnam War, a time when, to our shame, our veterans did not always receive the respect and the thanks they deserved -- a mistake that must never be repeated," Obama said. "And that's where I want to begin today, because the story of this Medal of Honor reminds us of our sacred obligations to all who serve."